- Books have been a big part of my life for as long as I can remember. My family has told me that I asked for books to be read to me all the time, over and over again. I had some books read to me so often that I would memorize them. When my parents had company over to the house, they'd tell them I could read already (I was only 2-3 at the time). Of course, our guests were blown away by my ability to "read." - In college, I read a book by Tim O'Brien called, "The Things They Carried." It's one of the best books I've ever read. It's a book about the power of story and taught me that stories can help teach us so many things about the world. - Let kids choose what they want to read and make reading fun. Join with them in reading books together and out loud. Take them to bookstores and to the library. Have them see you reading as well. 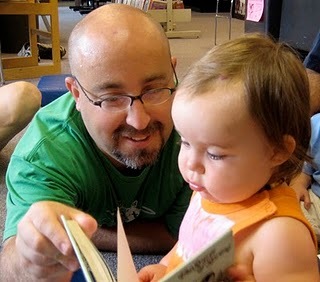 - I have no doubt that helping children develop a lifelong love of reading opens up a world of possibilities for them. - I’m not sure there’s anything more powerful in the human experience than the power of story. Stories teach so much to us. A story can teach us to have empathy for others, can show us perspectives in the world we may never encounter personally and can teach us ways to get through tough times. These reasons are partly why I’m such an advocate for reading to and sharing the power of story with children.